Download Hour1 Download Hour2 The show this week features two friends from different generations who dish the dirt on the US forced schooling system and the tax-exempt foundations which engineered it. 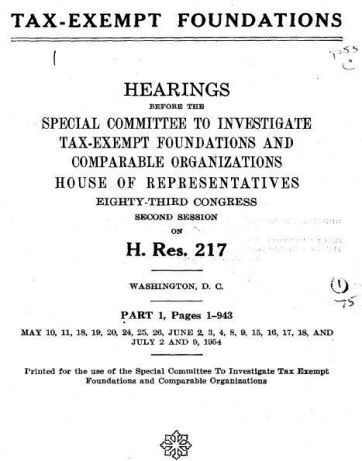 Our main interview is Norman Dodd, chief investigator of the 1953 'Reece Committee' on Tax Exempt Foundations, set in context by a reading from John Taylor Gatto's Underground History of American Education. Next it is Charlotte Iserbyt, ex-senior policy advisor in US Department of Education, followed by the first half of a 2004 Radio Free School interview with John Taylor Gatto. Our main presentation this week is a 50 minute interview by G. Edward Griffin of Norman Dodd, the chief investigator of the 1953 'Reece Committee' on Tax Exempt Foundations. After interviewing himself, he explains his role in the committee and recounts several pretty remarkable findings, that he says were so shocking to one member of the investigative team that she lost her mind. ...All of us [Foundation leaders] that have a hand in the making of policies here have had experience, either with the OSS during the war, or the European Economic Administration after the war - we've had experience dealing with directives, and these directives emanated from the White House [...] we still operate under these directives. Would you like to know what the substance of these directives is? [...] Mr. Dodd, we operate under directives, the substance of which is that we shall use our grant making power so to alter life in the United States that it can be comfortably merged with the Soviet Union. We then replay Lyn Gerry's reading of The General Education Board And Friends, a section of John Taylor Gatto's Underground History of American Education, which summarises the once prominent and widely understood role of tax exempt foundations in setting educational policy. This continues into our second hour, after which we hear a short section from Charlotte Iserbyt, recounting her gradual disillusionment with the reality of policies and goals as a policy advisor in US Department of Education under Ronald Reagan. We conclude the show with the first half of a 70 minute Radio Free School interview with John Taylor Gatto from December 2004, entitled Outing School. Thanks to Radio Free School for the John Taylor Gatto interview. Thanks to G. Edward Griffin for the Norman Dodd interview. This episode rebroadcasts content from 348, 357. Some of this episode's content is repeated in episode 731. This page was last modified on 23 January 2016, at 08:21.